The Schipperke was first bred in the 1600s in Flanders by a boat captain known as Renssens. It is a descendant of the Leauvenaar – a 40-pound Belgian sheepdog – and a cousin to the current black Belgian Sheepdog (Groenendael). It was bred smaller and smaller until it became a breed of its own. Originally, they were used for hunting game, herding livestock, and as watchdogs, but they later made a name as excellent barge dogs. 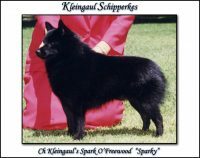 They were initially known as the Spitske or Spits dog until the name was changed to “Schipperke” – which is still a source of contention among experts. Some claim that it means “Little Captain” while others say that it translates to “Little Shepherd” in Flemish. The breed’s popularity grew in the late 1800s, especially in Belgium households, and it was soon exported all over the world reaching the United States in 1888. However, it was not until 1904 that it was recognized by the American Kennel Commission (AKC). 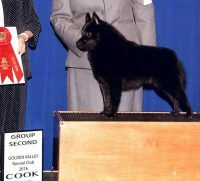 Nicknamed the “Little Black Devil” (LBD), it is a member of the Non-Sporting Group and comes in 102nd in AKC’s breed ranking. They have what many refer to as fox-like appearance with pointed erect ears on top of their heads. They have dark brown oval eyes and a square body profile. The breed sports a small black nose, a sloping back line, and a broad chest. 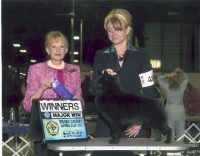 The Schipperke features a dense double coat with varying lengths. The undercoat is soft and fluffy while the outer feels harsher to the touch. They also have culottes (hind-leg fur). Males’ heights range from 11 inches to 13 inches at the shoulder while females range from 10 to 12 inches. Males weigh between 15 and 18 pounds, and the females’ weights start from 11 to 15 pounds. The AKC only accepts solid black as the only color to describe this breed. But, they also come in variations of tan and a range of blonde (blondes are silkier). Cream and darker shades of blue are also possible. The Schipperke has got the small dog – big personality down pat. They are loyal home protectors that will go to all ends to keep the family safe. They earned a reputation as watchdogs because they are fearless and devoted to their owners. But their loyalty does not always mean obedience. They are not called the LBDs: they are independent-minded, curious, mischievous, and a little too smart for their own good. They will often disregard your calls and dash off to chase anything that moves if not on a leash, especially if you have not established yourself as a strong leader. Exercise is essential to them as they have very high energy levels. If not taken for daily practice or runs, they will run around the house and sometimes break or mess up things. You also need to keep the doors locked if your yard is not enclosed because they tend to run out of open doors. They are very adaptable to town settings as long as you or your neighbors do not mind their constant barking. These dogs love the sounds of their voices, and they will back just because they can. They are very good with kids and get along quite well with cats. However, they can be suspicious of strangers and visiting dogs – but never mean or wild. Most experts recommend the country for the these dogs, but with proper training, they make perfect town dogs. Training should start at an early age since they become more headstrong with aging. Thus, you should enroll your dog to a puppy kindergarten when they are as young as 12 weeks if you want a calm and well-behaved adult. Also, you need to establish yourself as a firm and consistent leader but never a harsh one. The dog’s energy and intelligence can be otherwise channeled into activities such as trick training to keep them occupied. 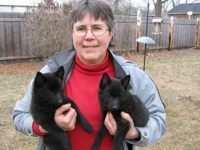 As cute, smart, and funny as they may be, the Schipperke can be a handful to novice dog owners and impatient experienced breeders. Schipperkes have no particular health problems, and most live up to more than 15 years of age. However, like most other breeds, they are susceptible to several health conditions. They can develop Autoimmune Thyroiditis, Legg-Calve-Perthes Disease, Epilepsy, Mucopolysaccharidosis Type IIIB, Patellar Luxation, cataracts, and hip dysplasia. Most health problems do not develop until the dog is two years old. So, only buy from breeders who can prove that breeding took place after the parents attained two years of age and that they were cleared of genetic disorders.